← Self Paced Training Videos Released! 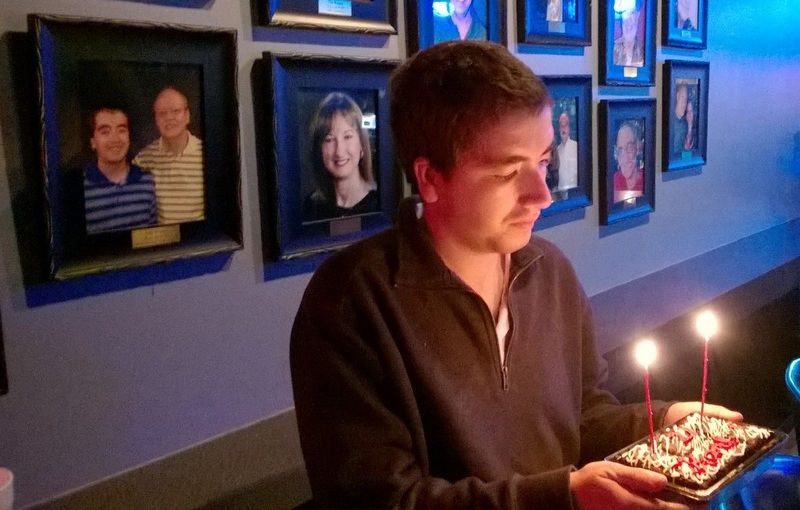 Announcements & Tips – Happy 21st Birthday Karl! NOTE: If videos do not play in Internet Explorer, use Chrome or another browser. The reason we do what we do is now 21 years old. We threw change at him from early on so he loves to go to new places and do new things! He loves to ride his mountain bike on trails and we just got this tandem to start doing longer on-road rides. 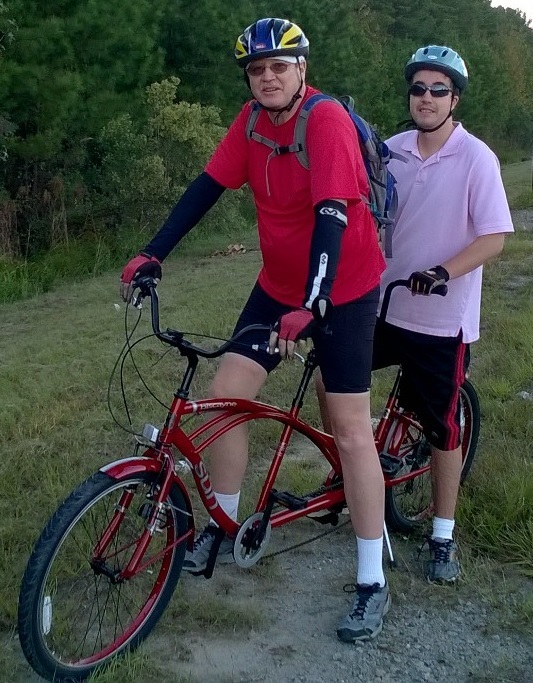 We did a 34 mile ride the week before the deluge of rain that hit Columbia SC a few weeks ago. We finally got back out this last weekend! It was nice to meet more of our customers & new contacts at Closing The Gap! Next DT Trainer Feature: New Report -> Student Configuration & Status! Tell us what YouTube videos and websites that you are using as reinforcers in the DT Trainer. What are the links? Would you like to share with us any related stories? Send your links and comments to Support@DTTrainer.com! Backup Your Students: Upon exit of the DT Trainer administration, the DT Trainer will give you a friendly reminder to backup your student data and tell you when you backed up last. The backup is streamlined and only takes a couple of clicks if you have already set the backup location. It is generally a good idea to backup the student data and configuration at least weekly. Send SLP the Student Train States Report: For students that have very poor expressive language skills, it is frequently hard to know what they know receptively. A student’s Train States Report filtered for the “Maintenance” and “Proficient” items, is the hit list for expressive and functional language development and in general making the knowledge functional. Frequently send the SLP this report as her/his hit list to make their time more efficient working on items that we have proof the student has receptively. Include others in the team and send home as well so that everyone is working on making this new knowledge functional. Use the “Email” button on the Student Train States Report and configure the SLP and other team members on the recipient list. RUN YOUR UPDATES: Depending on your settings, the DT Trainer will ask you to check for updates periodically when you launch the administration. If you have not done this in a while, you should also check for updates under the Common Administration, Maintenance Tools. In the updates tab, select the top radio button to see all the updates not already installed on the computer and install. Please contact us if you need any help or guidance in getting the most out of your DT Trainer and Activity Trainer licenses. As long as you have current Updates and Support on your license(s), new installations or reinstallations should be done from www.dttrainer.com -> Support -> DT Trainer Support… Or click here: www.dttrainer.com/support/dttrainer/ This is our latest installation image. If you do not have current Updates and Support for your license(s), email us for a quote. Reminder: If you still have old versions of the DT Trainer or Activity Trainer, they will not run on Windows 7, 8, or 10. Email us for a quote to update old licenses. Tell teachers and others with special needs students that are 2 to 9 developmentally about our 30 day free trials from our website. Email us for a quote if you would like to use the programs in additional self-contained classrooms. You’re receiving this email because you are on our mailing list. This entry was posted in AES News. Bookmark the permalink.